Given the conditions, the game might end in a draw as both the sides are going to take the field with only four proper bowling options. The Adelaide Oval with host the first match of the 4-match Test series between Australia and India starting December 6. The Virat Kohli-led Indian team is searching for their maiden Test series win in Australia. With a bowling line-up that can exploit any conditions, India are hopeful of their chances against a mediocre Australian side if their batting fires-up. India named a 12-man squad for the first match with only four specialist bowlers – Ashwin, Shami, Ishant and Bumrah. They will make a decision of picking one of Rohit Sharma and Hanuma Vihari ahead of the game. Rohit might get an edge due to his experience of playing in this part of the World and a solid net session. Vihari, on the other hand, is coming from a couple of good knocks in the game against New Zealand A and also in the warm-up game against CA XI. The hosts have excluded Mitchell Marsh from the playing XI and are going to hand a debut for the opener Marcus Harris. 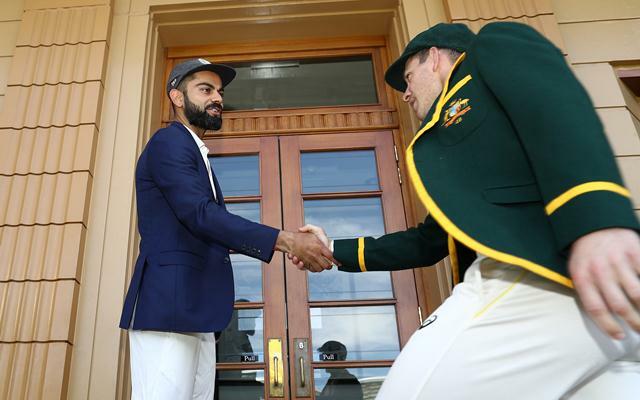 The first match of the four-match Test series between Australia and India will be hosted by the Adelaide Oval. The match starts on December 6th 2018 at 10:30 AM local time (12:00 AM GMT) (5:30 AM IST). Australia: L, D, L, L, L.
India: W, W, L, L, W.
The last three Test matches at the Adelaide Oval witnessed some low-scoring competitions with the pacers exploiting the green tracks. However, all those three games were day/night Tests and the pitch to be used for the first game of the Border Gavaskar Trophy is quite different from the previous matches. The grass that was covering the pitch until a couple of days before the game, was shaved off. With the temperatures expected to rise in the next days in Adelaide, the track could provide assistance to the spinners as the game progresses, especially in the 3rd and 4th innings similar as the meeting between these two teams in 2014. Tim Paine (C), Mitchell Marsh, Josh Hazlewood, Pat Cummins, Aaron Finch, Peter Handscomb, Marcus Harris, Travis Head, Usman Khawaja, Nathan Lyon, Shaun Marsh, Peter Siddle, Mitchell Starc, Chris Tremain. Virat Kohli (C), Ajinkya Rahane, Murali Vijay, KL Rahul, Prithvi Shaw, Cheteshwar Pujara, Hanuma Vihari, Rohit Sharma, Rishabh Pant, Parthiv Patel, Ravichandran Ashwin, Ravindra Jadeja, Kuldeep Yadav, Mohammed Shami, Ishant Sharma, Umesh Yadav, Jasprit Bumrah, Bhuvneshwar Kumar. Tim Paine (C & WK), Marcus Harris, Aaron Finch, Usman Khawaja, Shaun Marsh, Peter Handscomb, Travis Head, Pat Cummins, Mitchell Starc, Nathan Lyon, Josh Hazlewood. Virat Kohli (C), Ajinkya Rahane, KL Rahul, Murali Vijay, Cheteshwar Pujara, Rohit Sharma/Hanuma Vihari, Rishabh Pant (WK), Ravichandran Ashwin, Mohammed Shami, Ishant Sharma, Jasprit Bumrah. Adelaide Oval is Nathan Lyon’s most productive venue in Test cricket as the off-spinner has claimed 37 wickets in seven Tests here including a 12/286 in the 2014 Test match against Indian team. His counterpart Ravichandran Ashwin can come into the frame if the pitch stays on the drier side in the second half of the game. Tim Paine, Virat Kohli, Ajinkya Rahane, Cheteshwar Pujara, Usman Khawaja, Aaron Finch, Ravichandran Ashwin, Travis Head, Jasprit Bumrah, Pat Cummins, Nathan Lyon. It is tough to overlook Virat Kohli while considering multiplier options. The Indian skipper must be at least vice-captain or else they would be in trouble. Ravichandran Ashwin can be a captain option only if assuming there will be something for the off-spinner in Adelaide. Jasprit Bumrah and Nathan Lyon can be worthy picks as vice-captain. Pat Cummins has 30 wickets in the five Test matches in 2018 at an average of 19.7. He is by far the best Australian bowler this year as his partners in crime Mitchell Starc and Josh Hazlewood have taken 19 in six and 15 wickets in five Tests respectively. The duo has a bowling average of 37.68 and 38.13 respectively this year. As a result, both Starc and Hazlewood can be ignored for Cummins and Lyon. Given the conditions, the game might end in a draw as both the sides are going to take the field with only four proper bowling options. India, however, will start as the favourites.